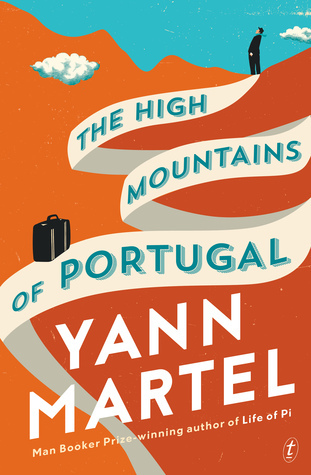 I loved Yann Martel’s Booker Prize-winning Life of Pi (2002) so I was looking forward to reading his latest novel The High Mountains of Portugal, but I am too bemused to decide whether to recommend it or not. I suspect that quite a few readers will be doubtful too. The first part entitled ‘Homeless’ begins in 1904 when in a sort of sufferings of Job scenario, Tomás – middle-class but not well-off like his rich uncle – falls in love with the uncle’s maid, wants to marry her but can’t because of class issues, has a child called Gaspar by her and discreetly keeps her as his mistress in his uncle’s house, until mother and child both die of diphtheria when Gaspar is still a little boy. Within the week his father dies too. Tomás responds to this tragedy by walking everywhere backwards, an element of the story which seems to have no relevance to anything except to show that Tomás objects to his fate. (Although if you’ve been to Lisbon and negotiated their glassy paving stones, you will know just how perilous walking in that city can be, whichever direction you take). Anyway, while working in his job as an assistant curator at the Lisbon National Museum of Ancient Art (which I’ve visited), Tomás finds an old uncatalogued journal by a priest called Father Ulisses. The journal shows Ulisses visiting the Portuguese slave colonies and having a Road to Damascus moment when the suffering of the African slaves is revealed to him, and he refers to a peculiar crucifix carved by one of the slaves which shows the contempt they have for a so-called Christian God who allows them to be treated so cruelly. Lo! Tomás sets off on an Odyssey to avenge himself on God with this crucifix, which by the hand of fate has made its way back to Portugal. From here on the novella descends into tedium. It’s 1904, and Tomás doesn’t get much leave, so the rich uncle insists on lending him one of his stable of cars so that he can travel more quickly up into the high mountains on his quest. It takes pages and pages and pages for Tomás to learn to get out of first gear; there are repetitive scenes of peasants and villagers all startled by and sometimes hostile to the vehicle, and by the time Tomás arrives bedraggled and filthy in a car that’s in worse shape than he is, it’s all a bit of an anti-climax. Especially since (not unlike Ulysses) he has committed an act en route which absolves the reader from having any sympathy for him. While I understand that an odyssey is by definition long, I have to admit that I almost gave up on the book altogether because this journey and all the detail about the car was so boring. I was so glad to get to the end of it that the existential crisis at the end failed to make an impact. Part II, entitled ‘Homeward’ jumps to New Year’s Eve in 1938, and it features a pathologist called Eusebio working late in a Lisbon hospital. His wife, a religious woman in her fifties, turns up to share her latest discovery from the Bible. She tells him about her classification of the miracles into those that benefit the body (raising Lazarus from the dead, turning water into wine et al) and the only that doesn’t i.e. the Resurrection which is an allegory. She goes on to say that all that is known of Jesus comes from four allegorists who weren’t even witnesses to Christ’s life, and that Jesus was lucky his message got out at all, given that it survived only by chance. And then she launches into her theory that the novels of Agatha Christie are the gospels of the modern era, solving the mystery of death. All the suspects who turn out not to be the killer are those who confronted temptation but resisted it, and the stories always deliver a murderer that readers always subsequently forget. Just as people remember Jesus the victim and not who actually killed him, so too do people remember Christie’s victims but not whodunit. Now, although a fresh take on theology is not really my cup of tea, I could see the point of this. It’s long-winded, the ending is bizarre and the details are overwrought, (especially some of the grisly stuff that pathology offers) but it nails the dilemma of marrying faith with reason. Faith is grand but unreasonable; reason is blind in adversity. And so to Part III, entitled “Homeward’ where a Canadian senator called Peter tires of his life after his wife dies, and has an existential experience in a laboratory researching primates, and rescues one of the chimps from a cruel captivity and goes off to the High Mountains of Portugal to live the simple life of his ancestors with his chimpanzee. Having lost the love of his life, Peter learns the ‘language’ and ‘culture’ of the ape and begins to savour life again. This part is the most engaging of the three because the growth of trust between man and ape is rather sweet, and parts of it are rather droll. Although it’s a very long time since I read Peter Høeg’s The Woman and the Ape (1997) it seems to me that ‘Homeward’ explores the same territory – the shared human and animal need for freedom and the nebulous border that separates humanity from animal. And because Peter has his epiphany in the ‘high’ mountains of Portugal, the three strands of the novel eventually come together to make a kind of sense. Without resorting to more spoilers, suffice to say that grief unites them all. Ursula K Le Guin in The Guardian had doubts about this book too, and I can’t find a review that doesn’t have reservations about it. There’s an interview with Yann Martel at Radio National. Thanks for your review. I found Life of Pi a bit suss and this new one I will happily skip altogether. Perhaps if the protagonist walked backwards through the streets of Melbourne, I might find something to enjoy in it. LOL you know we’re not meant to take it literally! Why didn’t you like Pi? Well … it’s been a while and unlike you I don’t take notes, but I struggle with fantasy, perhaps especially when it’s intended allegorically. I did listen through to the end though. In general, I would agree with you. I tend not to like fantastical worlds – though I loved Tolkien. And I usually react badly to fantasy in our own world, (sometimes called magical realism). But really good writing – and an intelligent purpose behind it – can overcome that for me. I think Martel achieved that in Life of Pi, but misses it in this one. I considered this but passed. Sounds like I made the right choice. I loved Life of Pi but it seems that Martel can’t quite any others as good as that one. Hopefully he figures it out. For now, after your review, I won;t be rushing out to read this one. LOL it must be hard to come up with something good after Pi!